Last week we discussed the limitations of forecasting. Condensed into one paragraph, my forecast said that world GDP will continue to decline, while the US will have slow growth – closer to 1% than 2% – but we shouldn’t plunge into recession without a shot across the bow to the US economic system from overseas. 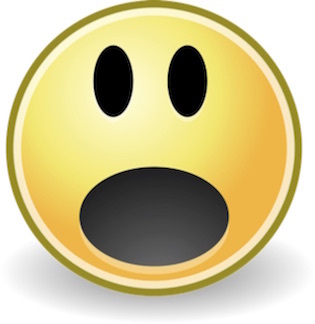 I speculated that such a shock might come from the collapse of Europe, a true crisis in China (beyond falling to 3–4% growth), or an uncharacteristically severe bear market in stocks. In the past, bear markets have not caused recessions – the causality is the other way around. But in the past, the US economy was not sputtering along at stall speed, so I don’t think we can rule out causation running the other way. All my other forecasts follow from those basic thoughts, which you can read if you like. So today we’ll look at 2016 forecasts from some professionals I trust. I know most of them personally and have been friends with some of them for years. I know they aren’t just “talking their book.” They may turn out to be wrong, but if so, it will be for the right reasons. After we review the forecasts, we’ll look at some common threads among them, as well as important differences. I should also note that some of the following material isn’t normally available to the public. My friends either sell it at very high prices or share it only with their well-heeled clients. They let me publish it for two reasons. First, they know I will present their opinions fairly and respectfully, even if I disagree. Second, they know my readers are intelligent folks with whom they might form fruitful business relationships. So if you see promising connections, I urge you to contact them and explore the potential. Now, on with the show. The venerable Bank Credit Analyst traditionally begins each year by transcribing a conversation with longtime (and possibly mythical) subscriber, “Mr. X,” who shows up in their offices very concerned and full of questions. Strangely, Mr. X always seems to reflect my own concerns, so I look forward eagerly to the BCA new year’s issue. Former editor and now chief economist Martin Barnes and his team endeavor to lay Mr. X’s concerns to rest. I have been reading the Bank Credit Analyst for 25 years. Much of what I learned early on about the markets I gleaned by reading and talking with Martin Barnes. The ring of authority and certainty in his deep Scottish brogue weaves a spell, making you want to believe that the world is as Martin sees it. That things often turn out the way Martin expects comes as no surprise. Some of my favorite personal moments have come sipping scotch with Martin late at night at Leen’s Lodge, Grand Lake Stream, Maine, gazing at the stars as we vigorously contend over the minutiae of economics. And if I ever become particularly confused, I have the privilege of being able to pick up the phone and call Martin, who will at least talk me off the ledge. However, I digress. This year, BCA says Mr. X is right to be concerned. The team believes the sluggish economic recovery stems from structural rather than cyclical factors. In BCA’s view, the “debt supercycle” (a concept they developed multiple decades ago) is now ending in a very slow turn that could take another decade or more to complete. We are not dealing with a normal balance-sheet recession and recovery. Modest income growth is constraining demand, which in turn constrains debt reduction. All kinds of interesting consequences spring from this view. BCA openly wonders if we may have reached “Peak Globalization.” This is a rather un-BCA type of thing for BCA to worry about – which makes me pay all the more attention. It is now on the list of things I must ponder. World trade volumes are no longer growing faster than world GDP. At the same time, technologies like 3-D printing and robotics are making it possible to produce goods closer to consumers. Thus, in order to compete, companies must set up factories closer to their final markets rather than building in their home countries and exporting. Calls for tighter immigration controls are really a form of trade tariff. They impede an important good – labor – from reaching its optimal position. Like Ian Bremmer (below), BCA believes China will avoid a hard landing, but they do foresee lower Chinese growth in the future. Emerging markets in general face tough times, especially those with excessive debt. BCA is mildly bearish on oil, gold, and other commodities and thinks the US dollar is likely to gain further against emerging and commodity-oriented currencies. The current global economic malaise of slow growth and deflationary pressures reflects more than just a temporary hangover from the 2007–09 balance sheet recession. Powerful structural forces are at work, the effects of which will linger for a long time. These include an ongoing overhang of debt, the peak in globalization, adverse demographics in most major economies, monetary policy exhaustion, and low financial asset returns. Investor expectations have yet to adjust to the fact that sub-par growth and low inflation are likely to persist for many years…. The Fed will raise interest rates by less than implied by their current projections. And the European Central Bank and Bank of Japan may expand their QE programs. Yet, monetary policy has become ineffective in boosting growth. Fiscal policy needs to play a bigger role, but it will require another recession to force a shift in political attitudes toward more stimulus…. The fundamental backdrop to corporate and EM bonds remain bearish and spreads have not yet reached a level that discounts all of the risks. A buying opportunity in high-yield securities could emerge in the coming year but, for the moment, stay underweight spread product…. The dollar is likely to gain further against emerging and commodity oriented currencies. But the upside against the euro and the yen will be limited given the potential for disappointments about the US economy…. Now let’s turn to geopolitical concerns for a moment. All my readers have had a chance to look at George Friedman’s 2016 forecast. New readers can access a summary for free here and find a link to the full version. I can’t tell you how thrilled I am that George has partnered with Mauldin Economics. He brings so much to our table with his insights. Rather than go over what you have hopefully already read (and if you haven’t, you should), let me highlight one position he has clarified further since he wrote that forecast. In a note entitled “The Precarious State of Italian Banks,” George and his team gave us an update on the serious financial problems facing Italy. You can find good news, but the bad news overwhelms the good. Nonperforming loans have now reached $216 billion, which is about 17% of Italian GDP. We have already seen some Italian banks fail rather spectacularly, and we are going to see that number increase. There is never just one cockroach. And while depositors are covered up to €100,000, that doesn’t do much good for businesses and wealthier households. Italian bank debt is now very suspect. As it happens, Italians, rather than depositing their money in the bank at very little or no interest, buy bank bonds to get at least some return. In the recent spate of bank closings, 130,000 shareholders lost €790 million. The four small banks that failed represented just 1% of total Italian bank deposits. The total amount of bank debt held by Italian households is €237.5 billion. That’s billion with a B. Think of it as high-yield debt on steroids – except that it is generally very low-yield. It’s not clear whether the Italian insurance deposit scheme has the money to cover even a fraction of the bigger potential losses. The ratio of assets to deposits covered is about 250 to 1. Now, the US FDIC’s required ratio is about 100 to 1, but US banks don’t have nonperforming loans of 17.9%, either. There’s a lot more to this story than my brief summary can detail, but the point is that the problems in Europe don’t stop with the immigration crisis. The credit crisis of a few years ago has not gone away. Italy’s debt-to-GDP is growing every year, and it was already at a critical level five years ago – before the ECB took rates into negative territory and bought massive quantities of Italian bonds. They can continue to do that, but can they buy Italian deposits and defaulted bank debt? That’s rather doubtful. This is a story we will be watching closely as it unfolds this year. You can sign up for George’s free “This Week in Geopolitics” letter here, or enjoy his team’s writings on a more or less daily basis for a phenomenally low introductory price by going here. Best deal in town. Staying with the geopolitical theme, my friend and geopolitical expert Ian Bremmer of Eurasia Group isn’t one to jump at shadows. He very often shows how scary headlines really aren’t so scary. He’s usually right, too. However, Ian and his Eurasia Group colleagues just published a detailed 2016 geopolitical risk analysis in which they foresee a “dramatically more fragmented” world in the year ahead. Political divisions are breaking down the existing order all over the globe. Unity is in short supply everywhere. Nowhere is this lack of unity more potentially harmful than in the US–European alliance. That relationship has been the cornerstone of the international architecture since the close of World War II. The NATO military alliance is only one facet. There is also the Bretton Woods currency regime, the United Nations, the World Trade Organization, the International Monetary Fund, and the World Bank. All are weaker and less relevant now than they have ever been. Why is the framework falling apart? Ian points to three reasons. First, China’s ascent, along with that of other emerging markets, added a new dimension to a previously bilateral world order. No longer can we reduce every conflict to “East vs. West.” Now both East and West contain several distinct power centers, each of which has its own unique interests and priorities. Second, Ian says, unilateral moves by both the George W. Bush and Obama administrations have displeased our allies. He cites both the electronic surveillance that Edward Snowden revealed and the growing “weaponization” of finance as forms of coercive diplomacy. Third, European leaders have their hands so full with internal political and economic challenges that they now pay less attention to global strategic issues. The result is that we have a bunch of powerful governments all going their own way. That’s why international bodies like the UN and IMF appear so paralyzed. To various degrees, they are paralyzed. Without their coordinating role, all kinds of conflicts will be more problematic than they were in the past. Ian’s second red herring is China. He thinks the Xi Jinping government can continue to manage its economic transition and maintain social order. China has its challenges, but the much-feared “hard landing” will not happen – at least not in 2016 – says Ian. Michael Lewitt’s newsletter, The Credit Strategist, is consistently on my “must-read” list. It is one of the better-written and more thought-provoking sources I follow. Unfortunately, his current outlook is not at all encouraging. He thinks we are in the early stages of unwinding the largest credit bubble in history. Things are going to get much worse before they get better. Investors need to learn to ignore what they are told by the establishment and think for themselves. The same government that wants to deny that radical Islamic terrorists seek to destroy us is telling people that the U.S. economy is strong. The same Chinese government that backs Iran and actively undermines American interests around the world claims its economy is growing at high single digit rates while electricity production, commodity prices and other data tell a much darker story. And a Federal Reserve that creates bubble after bubble while issuing forecasts that make weathermen look like Nostradamus tells us the economy is so strong that it plans to raise interest rates four more times in 2016 while commodity prices plunge, 96 million people can’t find work, and it could barely bring itself to squeeze a 25-basis-point hike out of its tightly clenched loins after seven years. Anyone who believes a word that any of these people say is, not to put too fine a point on it, a fool. Ouch. I assume he is not speaking of the Motley Fool kind. On the other hand, it is hard to argue with him. Positive spin from the US government, the Chinese government, and the Federal Reserve often fails to match reality. I think we can strike a middle road, however. Yes, take everything they tell us with lots of salt. It is not necessarily in their perceived interests to give us the complete, unvarnished truth. Occasionally, though, they slip up and give it to us straight. We should watch for those occasions and pay attention to them. Michael thinks the Fed will soon retract its December rate hike and launch another round of quantitative easing. More QE won’t help, but it is all they know how to do. In that scenario, Lewitt’s prescription is simple: sell all your stocks, buy gold, and ride out the storm. My old friend Doug Kass heads Seabreeze Partners Management and writes for RealMoney Pro. His custom is to identify 15 potential surprises that each new year could bring. You can read the full list here. Here are some I think are noteworthy. This may well happen, but I’ll say this: if we let terrorist threats disrupt our economies, it will likely be because we let fear take control. This one would not much surprise me, for exactly the reasons Doug states. We are overdue for a recession. I think it will more likely strike in 2017, but I would admit that the probability of a recession this year is not low. I think a painful stock correction is likely even if we avoid slipping into outright recession. It may have already started, in fact. I think stagflation could join "screwflation" as a concern for 2016. Wages could rise and non-energy commodities (particularly agricultural) could pass the Federal Reserve's inflation target despite disappointing US growth. Although we could see slowing and recession-like growth in 2016's third and fourth quarters, the yield curve won't invert. But oil and a drought that causes higher agricultural prices could raise headline inflation to well above the Fed's target. Our traditional inflation measures are less and less useful in reflecting everyday life. They overstate the benefits of lower oil and understate rising healthcare costs. The Fed hiked rates because it thinks inflation is approaching the target range, but wage growth is still mild or neutral. None of this makes sense. Under “stagflation” we could see flat wages, lower fuel costs. and higher food prices. The result would be net negative for most people, but it won’t show up in CPI or PCE that way. This one could easily happen. This week we posted a short video with George Friedman. He is very concerned about Germany, for reasons you will see in the video; and Germany is Europe’s core. I’ve learned not to underestimate the EU’s ability to postpone the inevitable, but I don’t see how their union can last much longer, at least as currently structured. David Zervos is the chief strategist at Jefferies & Company. He made a good call a year ago to raise European and Japanese stock exposure. Both outperformed US equities in 2015. Now he is losing confidence in that trade. He said this in a Dec. 22 year-end update. I am ending 2015 much less confident in both the European and Japanese QE-led reflation trades. Mario [Draghi] seems to have rolled over to a strengthening anti-QE German-led contingent. And Haruhiko [Kuroda] cannot seem to overcome the politically charged distributional asymmetries in stimulus that arise from a weaker yen. I certainly remain hopefully that they both can push ahead, but hope is no foundation for a high-quality trading theme. Instead, I’m pivoting back towards my old flame – Janet!! Thank you, David, for coining the phrase “politically charged distributional asymmetries.” It rolls right off the tongue. David goes on to say how impressed he is with his old flame Janet Yellen’s skillful management of the Fed’s lift-off from zero rates. He thinks reflationary momentum will intensify as the year goes on. To take advantage, he suggests what he calls the “spoos & blues” trade. Spoos are the S&P 500 stock index and blues are US Treasury bonds. One or the other should do well in 2016, he thinks. He does not think the US can go into recession until we get an inverted yield curve, and we are a long way from an inverted yield curve. Neils Jensen at London-based Absolute Return Partners is one of the most thoughtful analysts I know. Like me, he thinks long-term and rarely attaches a time frame to his forecasts. Jensen thinks the big story of 2016 may be a “third leg” of the global financial crisis. The first leg, of course, was the US subprime mortgage debacle and related breakdowns in 2007–2008. The second leg was the European sovereign debt crisis, which first blew up in 2010 and is still in progress, particularly in Greece. What could be the next leg? One possibility he mentions is a widening emerging-market crisis as commodity prices fall further or remain weak. If the Fed follows through on its rate hike plans (far from certain), the dollar will strengthen further. This will make it harder for non-US borrowers to pay dollar-denominated debts. That is a toxic combination for commodity-exporting companies and nations. Not only is their income plummeting due to low resource prices, but their debt servicing costs are increasing as the dollar moves higher. The potential for major implosions is significant. I think this fear probably explains IMF chief Christine Lagarde’s open pleas for the Federal Reserve to consider the impact on emerging-market nations as it tightens policy. There is little sign the Fed intends to do so. I would argue that Yellen is right to ignore Lagarde. The Fed’s mandate is to maintain maximum employment and price stability in the US, not to bail out other countries. Nevertheless, the Fed could well spark an EM crisis that will spiral out of control and hurt everyone. Jensen’s other “third-leg” candidate is a bond market liquidity crisis. New capital regulations discourage banks from holding non-sovereign bonds in inventory. The problem with this arrangement is that banks have long used their own inventories for market-making. They are the reason it is (or was) easy to move in and out of corporate and high-yield bonds with minimal slippage or delay. Liquidity is shrinking even as the amount of money in bond ETFs and mutual funds is growing. These products promise their shareholders daily liquidity. See the problem? Last month’s collapse of Third Avenue Focused Credit Fund may turn out to be the dress rehearsal for more such failures. 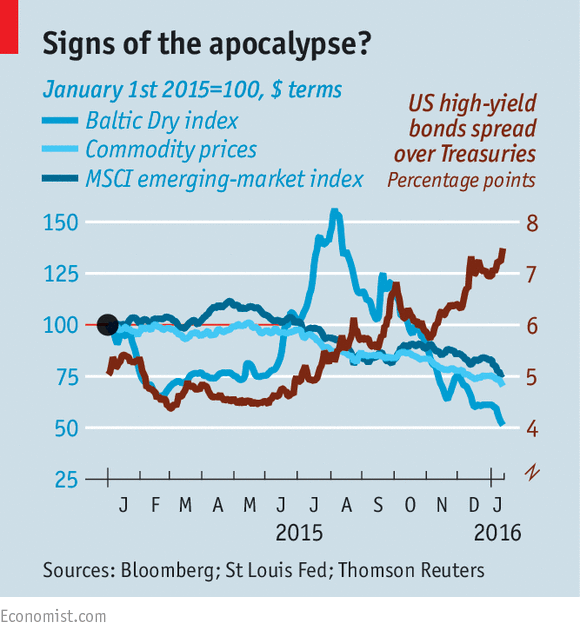 Jensen sees a high probability for both scenarios (EM crisis and bond liquidity crisis) to happen in 2016. Neither will be good, but the second one will have much greater impact on other asset classes like stocks, if it happens. And it would certainly not be good for world GDP growth. My book Code Red, written some 2½ years ago, laid out the rationale for why I and co-author Jonathan Tepper believed that the last half of this decade would see an intensifying currency war. Indeed, we made the point that Japan, under the guise of quantitative easing, had fired the first shot. Greg Weldon’s forecast for the next year is that the intensity of the initial currency skirmishes (my term) will increase this year. In his 2016 forecast he lists 20 countries that have seen the US dollar appreciate by 50% over the last five years, representing a total population of 2.2 billion people. He also notes the interesting fact (one that I missed – he is so good at finding these little details) that Zimbabwe is planning to use the Chinese currency in order to cement ties with China. I will offer one of Greg’s scores of charts. It shows that the oil-based economies – Mexico, Norway, Russia – have seen their currencies fall along with the price of oil. The exception – the flat line in the graph – is the Saudi riyal, which is dollar-pegged. Greg and I have been talking about these currency phenomena for a very long time. I’m not sure how far back we go. He is an old-school commodity trader and writer, and his rapid-fire PowerPoints and voice webcasts cover almost everything that can be traded. He is bullish the gold mining companies, with the caveat that, if the FOMC proves to be as hawkish as some of its members sound (i.e., for more interest-rate increases this year), then the dollar will get stronger and gold will come under intense pressure, possibly making new lows. I agree. If you can tell me what the Fed will do, I will tell you, with 90% certainty, what gold will do. The problem is, since I am reasonably sure that the Fed doesn’t even know what it’s going to do, it is very likely you don’t know what it is going to do, either. We are all guessing. And guessing makes for a very fraught trading environment. 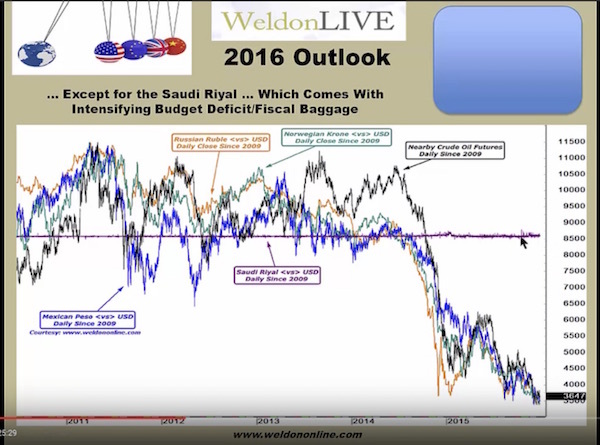 You can see the first part of Greg’s “2016 Outlook” here. Everywhere you look in the macro world, major and minor events reveal stress cracks at the edges. The Bank of Japan is now buying corporate bonds at negative interest rates in the open market. How in the Wide, Wide World of Sports can you have a functioning corporate bond market when somebody is buying at negative rates? The VIX is back above its 400-day moving average, which is historically a good buying opportunity. While the absolute nominal index number has been higher, getting above the 400-day moving average is not the norm. Long-term debt for oil exploration and production companies exploded by 70% since 2010 to $353 billion this last year, fueled by the low-interest-rate environment of the Federal Reserve. While the bonds are not selling well in the open market, the defaults are yet to come. Oil plunged below $30 this week, and there is a real possibility of its going much lower, given that Iran is, as of yesterday, free and clear to go into the markets with its production. I could list multiple dozens of odd and troubling facts, but the upshot is that the world has given us a difficult trading environment. Stick with me this year as I peer through the fog to find a few opportunities here and there. And let me end on a positive note. Even with all our economic and geopolitical troubles, the progress of humanity in overcoming many persistent problems has been persistent and impressive. Technology and social understanding are advancing on dozens of different fronts. Let me suggest you watch this short YouTube video. It shows Elon Musk’s Falcon 9 rocket landing on its pad. This rocket will cut the cost of space launches by 90% and perhaps eventually by 99% from today’s cost. If you can watch this video without your emotions jumping, if you can see the young men and women screaming in joy over their success and not want to join them in shouting as you watch the rocket deploy its fins at the last moment and touch down ever so gently, then you are probably an NSA spy cam linked to a computer and not a human being. How can you not be an optimist? Really? How can you not be? I fly next Sunday to Hollywood, Florida, where I will be at the ETF.com conference with some 2000 people, talking about all things ETF. I will be giving the keynote address at the Tuesday lunch, doing interviews, holding meetings, and of course doing the rounds of dinners and gatherings every evening. I expect to learn a lot. The following week I will go to the Cayman Islands to speak at the Cayman Alternative Investment Summit, one of the biggest hedge fund and alternative investment gatherings outside of the US. They have an impressive lineup of speakers, and I note that this year the celebrity guest speaker is Jay Leno. That should be fun. I just looked through the speaker list and noticed that Pippa Malmgren, who will also be at my SIC conference (see below), is speaking, and it will be fun to catch up with her again. I will be on a panel (moderated by KPMG chief Economist Constance Hunter) with old and brilliant friends Nouriel Roubini and Raoul Pal. At least I know that with those two guys there is no need to wear a tie. And that is pretty much it as far as the scheduled trips. I know I still have to get to New York and a half-dozen other places for short trips, and will let you know if I’m in your area. But we are really trying to limit the travel as the work on my book grows more intense. “Oh deadline, where is thy sting?” is the refrain that echoes in my mind. If you are trying to write a book on what the next 20 years will look like, you can’t take 20 years to write it. Let me remind readers that my Strategic Investment Conference will be held in Dallas, May 24–27. We are finalizing the speaker list, which you can see at the website, and have just confirmed Niall Ferguson. I should note that both George Friedman and David Zervos, whose 2016 forecasts we just sampled, are among our all-star lineup. I am excited that on Thursday night we will be going to the biggest C & W bar in Dallas (Gilley’s, for you locals) and taking over the entire place; in addition to longnecks, Mexican food, and barbecue, we will enjoy a conversational shoot-out featuring Michael Barone, Steve Moore, and Juan Williams, with a focus on the upcoming elections. Who knows – maybe we’ll be talking about Biden versus …??? And maybe even a brokered Republican convention. You can’t even imagine what chaos a brokered convention would be. I have been a delegate to national conventions, where I have been intimately involved with and have led multiple floor fights on the state level at the largest state convention in the country. We haven’t seen an open floor fight at the national level since 1948, and back then we had powerbrokers. Today there are no powerbrokers of any real consequence. And you may think that this or that candidate will walk in with a certain percentage of delegates that are “his” or “hers.” That’s not how it works. After the first vote, where you are committed, you are no longer legally bound. You simply have no idea what chaos could ensue. Maybe I should write about that story. The Rules Committee for the national convention, whose work is normally both arcane and mundane, is already engaged in serious discussions. And if things haven’t changed by the time the gavel falls to open the convention, the convention gets to adopt its own rules. Normally, the rules suggested by the Rules Committee go uncontested. (I think maybe in ’76 the Reagan delegates kicked up a little fuss.) Adding to the fun, the current Rules Committee members generally have to be reelected before the next convention. I can guarantee you, last year no one thought the most interesting committee assignment would be on the Rules Committee. And maybe it won’t be. The flipside of a brewing floor fight is that the media would be focusing on the convention for months in advance and would go to 24-hour coverage during the convention. It would be the ultimate reality TV show. Who gets voted off the island? Who gets fired? You couldn’t buy that kind of TV time. It is time to hit the send button. I think I am going to see Leonardo DiCaprio in The Revenant. My “Sunday off” will be spent reading Matt Ridley’s new book, The Evolution of Everything. A relaxing way to do research for my own book. Cool techie hint: if you read a book in the Kindle app (as I do on my iPad), you can highlight and make notes and then go to them on your personal Amazon Kindle page at some later date. You’re actually allowed to cut and paste from there. I fantasize about having my highlighted sections and notes from every book I’ve read for the last 50 years somewhere in the cloud. Dear gods, I would be dangerous. That Sainty Marine workers have resorted to such actions is perhaps not surprising. The global shipping industry is depressed, plagued by oversupply at a time when slowing trade means demand for new ships is shrinking. Chinese firms that rushed to expand are now gasping. Many workers at other hard-hit companies, especially in heavy industry, are facing similar frustrations. The China Labour Bulletin, a watchdog group based in Hong Kong, recorded 2,774 strikes and worker protests nationwide in 2015, double the 1,379 posted in 2014. Police arrested four labour activists last week in the southern province of Guangdong, China’s manufacturing heartland—a sign of the authorities’ unease over the growing protests. Although the swooning stockmarket and falling currency have captured global attention in recent days, the effect of slowing growth on employment is a more sensitive problem for the government. The Communist Party has always treated markets and, by extension, investors with a certain disregard. Workers are different: the steady improvement in their living standards over the past three decades has helped to legitimise the party’s rule. How worried should it be? The stresses have made only a small dent so far in overall employment figures, at least in the official telling. The jobless rate crept up to 5.2% at the end of September from 5.1% at the start of last year, according to the latest government survey of 31 big cities. Manufacturing firms are clearly cutting jobs: the employment index in the closely watched Caixin survey of the sector dipped to 47.3 in December—its 26th consecutive month below 50, the threshold marking a contraction. But for services, a bigger share of the economy than manufacturing, Caixin’s employment index hit 51.3 in December, above last year’s low of 50.1 in August. That points to an expansion. However, the employment data are flattered by two uniquely Chinese shock-absorbers. 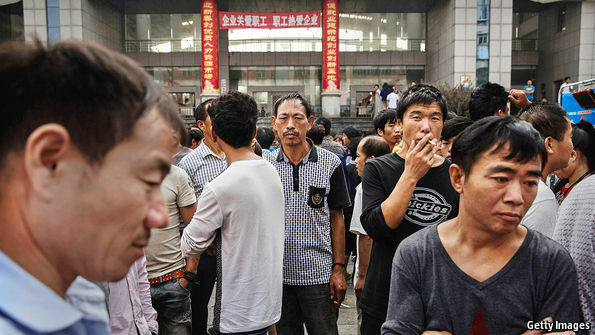 First, the hukou system of household registration means that some 270m migrant workers who have gone to cities for jobs do not enjoy a permanent right to live in them, let alone collect unemployment insurance there. When they lose their jobs, they are expected to return to their original homes, often in the countryside, and do not count as unemployed. In 2008, at the height of the global financial crisis, tens of millions of migrants simply went back to rural areas, tilling fields or scrabbling for meagre pay in villages. There has been no similar exodus this time, but the countryside remains a safety valve that can help to absorb the unemployed. The other buffer is one of the things hobbling the economy in the first place: state-owned enterprises (SOEs). Private firms are better run and more profitable, but SOEs, with their political backing, have far easier access to finance and dominate a series of restricted sectors, from energy to transport. These privileges carry with them political duties, including an obligation to help maintain social stability by refraining from laying off workers. With the army planning to cut some 300,000 positions as part of a modernisation plan, the government reminded SOEs last month that they are required to reserve 5% of vacancies for demobilised soldiers. In a working paper last year, analysts at the International Monetary Fund noted signs of “increased labour hoarding in overcapacity sectors”, helping to suppress unemployment at the cost of weaker productivity. But even SOEs do not have infinite resources. Loss-making companies with little prospect of turning round their performance are starting to shed workers. Longmay Mining, the largest SOE in the northern province of Heilongjiang, said in September that it would cut up to 100,000 jobs, nearly half its workforce. 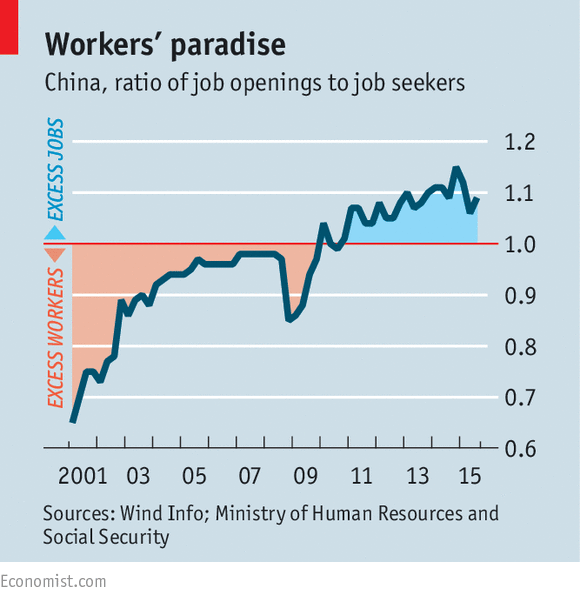 China’s economy should, in theory, be able to accommodate many of the unemployed. The working-age population peaked in 2012, so all else being equal, there is less competition for jobs. At the same time, the economy’s tilt towards the services sector, which is more labour-intensive than industry, generates jobs even as growth slows. Services probably accounted for more than half of China’s GDP last year for the first time in decades, and their share is growing: in nominal terms, service output grew by 11.6% year-on-year in the first nine months of 2015, whereas manufacturing grew by just 1.2%. The central bank estimates that as long as the service sector’s share of GDP increased by one percentage point in 2015 (in fact, it did better), the economy could have slowed by nearly half a percentage point and yet still generated the same number of new jobs as it did in 2014. This helps to explain why employment centres around the country still report a shortage of workers: an average of 1.09 vacancies for every applicant (see chart). For those hoping to be hired by accounting firms or restaurants, opportunities are plentiful. The problem for shipbuilders and coalminers is that many of the service jobs are destined for younger people with more education, and the jobs they can get, whether as janitors or cooks, often pay less well than their current work. The government has promised to provide retraining for those who lose jobs in industry, but that can only help so much. “Most of these guys can’t just go from making a living by their brawn to making a living by their brains,” says a recruiter at the human-resources centre in Yizheng. For the employees of Sainty Marine, the question of what their next job might be is not the most pressing one. They have been showing up to work without getting paid. Mr Wang, 45, a welder, has a note signed by a manager stating that he is owed several months’ salary, money that he needs to pay back relatives who lent him cash to build a house. He joined the group blocking the highway, but that achieved nothing. He has tried to corner his bosses, but that also got him nowhere. Lately, he says, he has been looking at the crane, sizing it up for a climb. Today, after spending $1.6 trillion on that war and killing 101 terrorist chieftains, from Osama bin Laden to “Jihadi John,” the West remains just as vulnerable, if not more so, to extremists who can recruit fighters and strike any Western capital virtually at will. Now that another president – François Hollande of France – has also declared war on terror (as have other European leaders), are the prospects for victory really any better? I have my doubts. If Hollande, the next US president, and their Arab allies are to stop terrorism, they must press (and help) Middle East governments to provide their people with the protections that will nurture their potential to prosper on equal terms in the global market. That is what the American and French revolutionaries did. And it is the surest way to deny extremists the attractiveness that sustains their existence. While Iran has 30m to 40m barrels sitting in tankers offshore, this is mostly ultra-light or condensate. It is hard to sell quickly and will not have much effect on the crude price. Ms Croft said the market is likely to tighten in the second half of the year despite the return of Iran, arguing that there are very few spots in the world other than Libya able to crank up output quickly. GLOOM seems to have descended at the start of 2016. Equity markets have had the worst start to the year in at least two decades. The great and the good have queued up to warn of the dangers ahead. George Osborne, Britain’s chancellor, spoke of a “cocktail of threats” facing the global economy. The chart shows a number of indicators of concern, from rising credit spreads (the interest-rate premium paid by risky borrowers) to slumping stockmarkets in the emerging world. Investors have many worries. 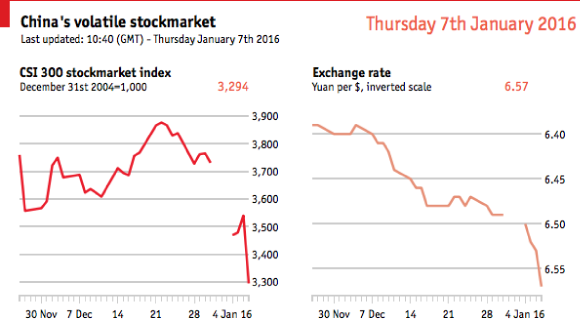 The first is that the Chinese economy is weaker than the GDP statistics suggest. Falling commodity prices, the collapse in the Baltic Dry index (which tracks the cost of shipping bulk goods) and the sluggish growth of global trade can all be seen as signs of weakness. Given China’s importance to global growth, this means that 2016 may turn out to be yet another year when growth disappoints. Mr Soros sees a parallel with 2008 in the rapid credit growth in China and other emerging markets. If growth slows, borrowers may be unable to repay their debts. Similarly, emerging-market companies that have borrowed in dollars may be in trouble if their currencies depreciate. Asian nations might be forced to devalue if China lets the yuan fall sharply. The second concern is that the Federal Reserve might have miscalculated when it pushed up interest rates in December—the first increase since 2006. The employment numbers in America may still be strong, as December’s muscular payroll numbers showed, but the labour market is a lagging indicator. The Atlanta Fed’s nowcasting model suggests that GDP growth in the fourth quarter was just 0.8% at an annualised rate. Manufacturing looks weak: the purchasing managers’ index has been below 50 (which signals contraction) for two straight months. A related worry is that the global economy has become over-dependent on the stimulus provided by low interest rates and quantitative easing (QE). Such policies may have saved the world from another depression, but they have not led to a return to pre-crisis growth rates. Moreover, by pushing up asset prices, they have spurred inequality. Nor has the problem of high debt levels been eliminated; the debt has simply been shifted from the private to the public sector. A swift return to what used to be thought of as “normal” interest rates (3-4%) would prove crippling. Martin Taylor, manager of a hedge fund called Nevsky Capital, detailed his concerns in a farewell letter to clients. Despite having earned an average annual return of 18% for 15 years, he is closing the fund. He fears that the global economy has become too dependent on China and India, where he does not trust the economic data. Individual equities have also become riskier, since companies have taken advantage of low rates to borrow more. And the equity market is less transparent, with trading dominated by index funds and computer programs. The risk of sudden, sharp shifts in prices has grown. “We could be caught up in an erroneous market trend, which could then persist for far longer than we could take the pain,” Mr Taylor wrote. All this is in stark contrast with the idea of fund managers as “masters of the universe” or the Thatcherite mantra, “You can’t buck the markets”. Since 2008 central banks have shown they can bend the markets to their will, at least for a while. Investors have to devote a lot of their time to poring over every word of central bankers’ speeches and statements for a change in policy emphasis. He thinks a global recession and widespread deflation are on their way. This may still be a minority view, but more people are listening: SG’s annual bearfest in London this week had 850 attendees, a record audience.